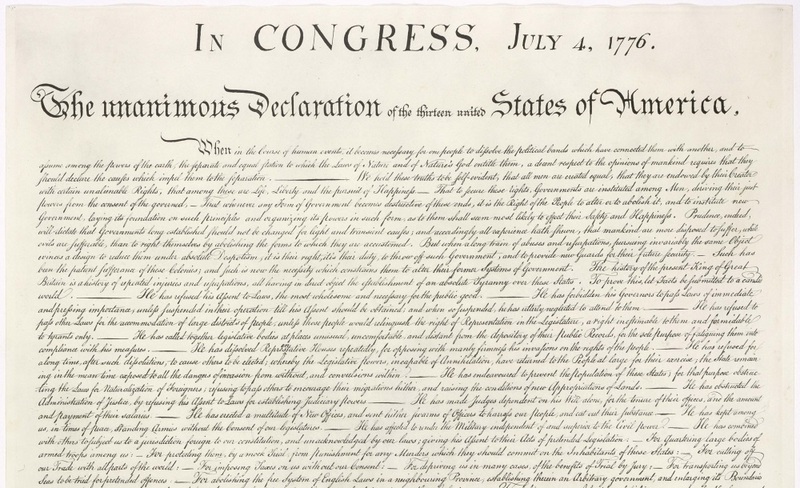 The Declaration of Independence, mainly drafted by Thomas Jefferson, was adopted by the Continental Congress on July 4, 1776, and announced that the thirteen American colonies, then at war with Great Britain, regarded themselves as thirteen newly independent sovereign states, and no longer part of the British Empire. Instead they formed a new nation – the United States of America. What were the central points that Jefferson wanted to make? Moreover, how did he imagine the society and government of the newly independent states? Im Kongress, 4. Juli 1776. When in the Course of human events, it becomes necessary for one people to dissolve the political bands which have connected them with another, and to assume among the powers of the earth, the separate and equal station to which the Laws of Nature and of Nature’s God entitle them, a decent respect to the opinions of mankind requires that they should declare the causes which impel them to the separation. Wenn es im Gange menschlicher Ereignisse für ein Volk notwendig wird, die politischen Bande zu lösen, die es mit einem anderen Volk verbunden haben, und unter den Mächten der Erde den selbstständigen und gleichen Rang einzunehmen, zu dem die Gesetze der Natur und des Schöpfers der Natur es berechtigen, so erfordert eine geziemende Rücksicht auf die Meinung der Menschheit, dass es die Gründe darlegt, die es zu der Trennung veranlassen. We hold these truths to be self-evident, that all men are created equal, that they are endowed by their Creator with certain unalienable Rights, that among these are Life, Liberty and the pursuit of Happiness. That to secure these rights, Governments are instituted among Men, deriving their just powers from the consent of the governed, That whenever any Form of Government becomes destructive of these ends, it is the Right of the People to alter or to abolish it, and to institute new Government, laying its foundation on such principles and organizing its powers in such form, as to them shall seem most likely to effect their Safety and Happiness. Prudence, indeed, will dictate that Governments long established should not be changed for light and transient causes; and accordingly all experience hath shewn, that mankind are more disposed to suffer, while evils are sufferable, than to right themselves by abolishing the forms to which they are accustomed. But when a long train of abuses and usurpations, pursuing invariably the same Object evinces a design to reduce them under absolute Despotism, it is their right, it is their duty, to throw off such Government, and to provide new Guards for their future security. Wir halten diese Wahrheiten für selbstverständlich, dass alle Menschen gleich erschaffen wurden, dass sie von ihrem Schöpfer mit gewissen unveräußerlichen Rechten ausgestattet wurden, wozu Leben, Freiheit und das Bestreben nach Glückseligkeit gehören. Dass zur Sicherung dieser Rechte Regierungen unter den Menschen eingeführt worden sind, welche ihre rechtmäßige Gewalt von der Einwilligung der Regierten herleiten; dass sobald eine Regierungsform diesen Zwecken schadet, es das Recht des Volkes ist, sie zu verändern oder abzuschaffen, und eine neue Regierung einzusetzen, die auf solche Grundsätze gründet, und deren Macht und Gewalt so gebildet wird, dass die Erhaltung ihrer Sicherheit und Glückseligkeit gewährleistet wird. Zwar gebietet Klugheit, dass von langer Zeit her eingeführte Regierungen nicht um leichter und vergänglicher Ursachen willen verändert werden sollen; und demnach hat die Erfahrung von jeher gezeigt, dass Menschen, so lang das Übel noch zu ertragen ist, lieber leiden und dulden sollen, als sich durch Stürzen solcher Regierungsformen, an die sie gewöhnt sind, selbst Recht und Hilfe verschaffen. Wenn aber eine lange Reihe von Misshandlungen und gewaltsamen Eingriffen, unablässig auf das eine Ziel gerichtet, den Plan bekunden, sie unter uneingeschränkte Herrschaft zu bringen, so ist es ihr Recht, ja ihre Pflicht, solche Regierungen abzuwerfen, und für ihre künftige Sicherheit neue Beschützer zu bestimmen. 1 | The Declaration of Independence was divided into five sections: an introduction, a preamble, a body (divided into two sections) and a conclusion. The introduction stated that seeking independence from Britain had become “necessary” for the colonies. While the preamble outlines the circumstances that justify a revolution, the body of the document lists accusations against the British Crown. a) Read the extract of the Declaration of Independence and briefly summarize the most important aspects. b) Explain the purpose of this document in your own words. 2 | In the very first sentence, Thomas Jefferson called the Declaration of Independence “unanimous”. a) Why do you think he included this information? b) The preamble states “that all men are created equal." Would you agree? c) The preamble also mentions “unalienable rights” which each person has by nature. Enumerate those rights and explain in your own words what is meant by the term “unalienable rights." d) Describe the relation between people and government as proposed in the Declaration and explain how it differs from the relation the colonists had to their former government. Keep in mind that the unalienable rights were announced in the same document. 3 | The Declaration of Independence has been called the “birth certificate of the United States”. Every year on July 4th, Americans commemorate its adoption and celebrate their independence from Great Britain with fireworks, parades, barbecues, fairs, concerts, family reunions, and political speeches and ceremonies. Can you find reasons why the declaration is regarded as so important, even more important than the following Revolutionary War? 4 | Read the extract again. Which ideas and thoughts addressed in the Declaration of Independence would/wouldn’t you agree with? Say why.